​What is a house call? House call is a scheduled home service or office visit by The Clock Repair Specialist to diagnose and troubleshoot the clock. What diagnostic work and troubleshooting is done during a house call? Diagnosing and troubleshooting a clock includes checking the weights to ensure they are in correct order, checking the chime and strike for correct sequence, checking the pendulum if hung correctly and has an even beat or an even tick-tock, checking the condition of the oil, and checking if the clock is level. It also involves a closer inspection of the whole mechanism to include checking the pivots and bushings for wear and functions. 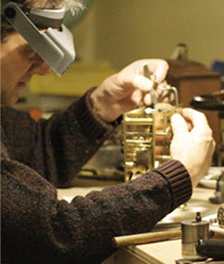 The Clock Repair Specialist offers clock repair, clock restoration, clock conservation, clock dial restoration (re-silvering and re-waxing), clock maintenance and cleaning, oiling, remove and replace movement, identification and damage quotation for insurance, moving and setting up of grandfather clocks to include pick-up and delivery service. What type and makes of clocks are serviced? Clock repair in Denver is available on all makes and types including American clocks (kitchen, mantle, wall, weighted); Long case clocks (grandfather, grandmother, granddaughter, hall, four and nine tube Herchede, 30-hour and 8-day early long case); French clocks (mantle, four glass crystal regulator, early two and four pillar clock, carriage clock, strike repeat, early silk suspension, French marble time and strike); British and German made clocks (bracket, one and two fuse mantle clock, regular drop dial, station clock fuse, Vienna regulator, and cuckoo clock); Swiss-made ATMOS clock; Modern all style clocks; and electric clocks. All clock restorations, complete overhauls including remove and replace of movement is guaranteed for 12 months. How does The Clock Repair Specialist distinguish itself from other clock repair business? The Clock Repair Specialist offers a personal, qualified, experienced, and secure service to every customer. Cost estimates, approximate length of time, and detailed invoice on all work are provided for every transaction. It is a policy of The Clock Repair Specialist to provide customers a call before proceeding on any additional work. In addition, as part of customer service, customers are mailed a reminder when their clocks are due for oiling and clock service, or modern or antique clock repairs.